How Panasonic projectors supplied by XL Video were used to create a state of the art video show for the launch of Coldplay's latest album 'Ghost Stories'. The shows, developed jointly by Ben Miles, Paul Normandale, Misty Buckley and Phil Harvey, were intended to create an intimate ambience, bringing the audience closer to share the new songs. For the global album launch in Los Angeles, the creative team was asked to create a planetarium-style 360 degree projection all around the space and across the entire ceiling above. 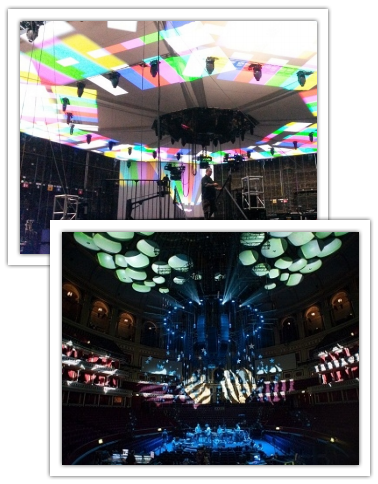 Whilst for two, sold-out, Royal Albert Hall shows, Ben Miles specified that the projections would cover the venue's iconic acoustic mushrooms. A total of 62 Panasonic PT-DZ21K, 20,000 lumens projectors were used to help create a Sky Full of Stars. The TV special used 46 Panasonic PT-DZ21K projectors controlled by eight newly purchased AI I8 media servers (four live and four hot backup); the largest number of projectors XL Video has ever supplied for a single show. The Panasonic projectors have previously helped to create the audio-visual backdrop for artists as diverse as Roger Waters snd Fat Boy Slim. This very first album preview featured a small central stage, with the majority of the projectors positioned on the floor around the venue, lighting up a total projection area equivalent to six 4K surfaces. The resulting show created an atmospheric visual spectacle. Against this backdrop, the band played the album in its entirety, together with a selection of their most popular hits. As Ben Miles, of MixedEMotionsLondon, explains, for the TV special, the concept was to create a truly immersive experience for the crowd and those watching at home, "It was about the band wanting to play some more intimate shows and get closer to the audience to really interact with them more. Playing large stadium shows can often mean being a long way from the audience. So we looked at numerous 'B' stages, we talked about outdoor spaces, theatres and places like the Roundhouse and felt that they were too restrictive for projection distances." In the end, the creative team recreated London's iconic Roundhouse within Sony Pictures Studios, in Los Angeles. "Ghost Stories is more of a personal thing for lead singer Chris Martin and the band. The set designer had already built a model of what they wanted it to look like, in the round style, which had some big theatrical flats they were going to use to project on," added Ben Miles. "The size of the DZ21K was a massive factor. It seemed to be a similar size in terms of footprint as some other projectors but when you look at it the body size inside the frame was a lot smaller. We were putting them amongst the seats and the width of the projector when it's sat next to someone was also a big factor." "The day before the show they were quite worried and I had to tell them to not worry, it's going to look really good and you'll be amazed. That night we got into the real projection line ups and tweaked everything as perfectly as we could. So the next day when the band came in with the lights off and projectors on and that's when Chris called me up on stage and said he liked it, thank god!" thinking was needed to find the best solution. XL supplied 16 Panasonic projectors for this, all offering 1920 x 1200 HD outputs and the images were again mapped using four AI S8 media servers (two live and two hot backup). The projectors were rigged in various upper level boxes and focussed on to the roof. Each one covered between four and six mushrooms, with the playback content used in Los Angeles, reformatted to fit. "Having already spent a long time working with the Panasonic projectors we already knew how compact the unit size was and the frame around the outside worked excellently for us in terms of being able to rig it at slightly different angles and using different clamps and ratchet straps. 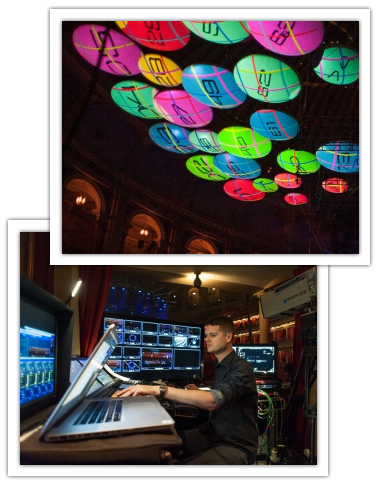 We already knew we could rig the projectors at any angle we liked and the Royal Albert Hall is very restrictive in terms of rigging points," added Ben Miles. The PT-DZ21K offers breathtakingly beautiful images, easy maintenance, and reliable operation. 20,000 lumens of brightness, and a host of rich creative capabilities, are packed into an extremely compact body. Contrast, depth, and clarity are integral to the PT-DZ21K. Its four-lamp system enables stable extended operation, with quad, triple, dual and single-lamp modes allowing for continual projection, 24/7.